What is Trumponomics, and how does it affect gold and silver prices? Alain Corbani of Finance SA explains the concept in this interview. At this year’s Mines and Money Americas conference in Toronto, the Investing News Network had the chance to speak with Alain Corbani, head of commodities at Finance SA. Corbani noted that gold is currently in a cycle that started three years ago and will continue for the next few years. He believes that this cycle is affected by Trumponomics, which is the idea that US President Donald Trump’s aggressive fiscal policy will bring down the US dollar, leaving room for gold to rise. “He has got into a very aggressive fiscal policy, and this fiscal policy is going to make higher deficits. And when you have some inflation, higher deficits and debt to GDP that is close to 100 percent, real interest rates are staying low and the dollar, the US currency, will weaken,” Corbani said. Like many industry experts, Corbani sees the strong greenback as one of the main reasons that gold and silver have taken so many hits this year. “Gold [and silver] went down mainly because the US dollar got stronger. So as I said earlier, I expect the US dollar to weaken, so these two quarters of weakness will not last,” he explained. Read the transcript below for more insight from Corbani, including his thoughts on how the markets will look in Q4 and what he sees precious metals doing in 2019. You can also click here to view our full Mines and Money Americas interview playlist on YouTube. INN: Just to jump right in, is there anything from this conference that you’re particularly hoping to see or talk about throughout the three days? AC: It’s my first real conference in Toronto. Toronto for me means a lot because this goes back to my professional resources. This is where I started in the business story 26, 27 years ago. So I really expect to send a message of truth to the investment community in Canada, and especially in Toronto vs. Vancouver. So a language of truth about the reasons why we should invest in the precious metals sector vs. just talking about promotion, about a lot of companies, mining companies. INN: Now, you’re speaking tomorrow and you are talking about Trumponomics and how it affects gold. Can you tell me a little bit about what Trumponomics is and how it affects precious metals? AC: So it’s funny that you asked the question, because a colleague of mine, I have to credit him for this sentence. He said, “why don’t you say something like ‘make gold great again’?” I felt this is great. This is exactly what I’m trying to do. But you know, with or without Trump we are going to go through a gold cycle problem. We started this cycle three years ago. It’s going to last another few years. We should enjoy it. So how does Trump impact the price of gold? It’s very simple. He has got into a very aggressive fiscal policy, and this fiscal policy is going to make higher deficits. And when you have some inflation, higher deficits and debt to GDP that is close to 100 percent, real interest rates are staying low and the dollar, US currency, will weaken. This goes back to my presentation, and I’m sure you are going to ask me a question about my presentation. But my point here is to say, if you’re heavily indebted like the US is, if you are running twin deficits like the US is doing now, and if you have some inflation, your dollar is meant to weaken. Nobody is seeing this picture, and this is what I’m going to say tomorrow. So the real picture is everybody is shorting US treasuries because they are betting on higher rates, but the reality is that rates might go higher, but not much higher. And this is where we start talking about technical wording about policy stance and equilibrium levels of real interest rates. The markets are forward looking, so the markets have already integrated the fact that rates will go up, but not much higher because of this equilibrium between deficits and debts. INN: That was great, that’s exactly what I wanted to know. I think everyone wants to know what Trumponomics is and how it affects gold. And since we’re speaking about gold, and if you can talk to silver as well — the last quarters haven’t been the greatest for either of the metals. Could you tell me a little bit about what you think happened to them during the last two quarters and what were the main factors that pushed the prices down so low? AC: The reason why — well, silver is more volatile than gold, so technically speaking or if we look at the statistics, if gold goes down by 10 percent you expect silver to follow gold and with more volatility. So this is exactly what happened, and gold went down mainly because the US dollar got stronger. So as I said earlier, I expect the US dollar to weaken, so these two quarters of weakness will not last. INN: And you were predicting that the US dollar will go down — do you see that happening in the fourth quarter or do you think that’s more of a 2019 thing? AC: I do believe that we are going — I mean, if I had to make any forecast, I don’t think that we would have to wait to 2019 to see this weakness. 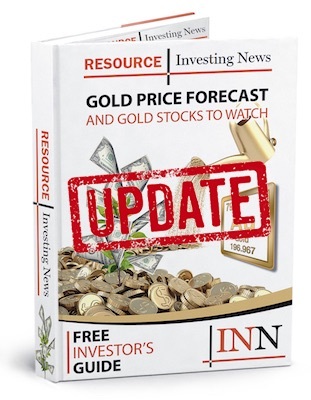 INN: And while we’re talking about 2019, as the new year’s approaching, can you tell me what you think will happen with silver and gold in terms of supply, demand and prices? AC: Supply, demand are lagging indicators, so I’m not going to waste our time with this. But the point is that we started the gold cycle three years ago and this cycle is going to last a few more years. So definitely we’re going to see higher silver and gold prices over the next couple of years.